Michael McFadyen's Scuba Diving - Tambea Caves In my other articles on diving in the Solomon Islands, I mentioned that great diving can be found very close to the capital Honiara. Further afield from Honiara, a full day trip can give you two excellent dives, one on a submarine and the other on a series of tunnels in a coral reef. Just over 40 kilometres to the west of Honiara is the village of Tambea. Also located here was the Tambea "Resort". I have heard that this resort is no longer operating due to the ethnic problems in the Solomon Islands that started in early 1999. See later comments. Dive Solomons, owned by Troy Griffiths, ran trips to Tambea to dive these two sites. The hour long bus trip gave you the chance to see some of the more remote sections of Guadalcanal before arriving at the Resort. After lunch at the Resort, it is another short run out to Tambea Reef for a really great dive. 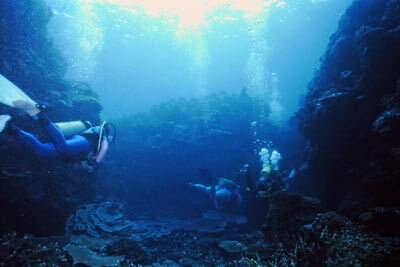 The reef is not that big but what there is hides the real attraction of the site. Caves! People who know me would know that I love tunnels, caves and swim-throughs. This dive was not to disappoint me. 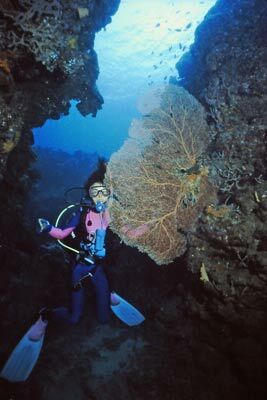 Led by your divemaster, you go on a trip through about half a dozen tunnels or caves that make a labyrinth. You travel through one cave and then after a short trip outside enter another cave that joins up with more. After your guided tour, you are free to re-explore the caves and eventually make your own way back to the boat. 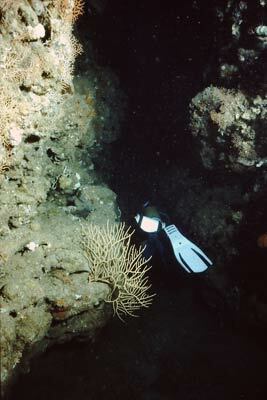 The caves are usually fairly wide (one or two metres) but in at least one spot it is a tight squeeze but even large divers can make it through. This dive was in very clear water (24 metres visibility) and very enjoyable. If you go to Honiara on a diving trip, I can really recommend this dive. Underwater photographs taken with Niklonos IV-A in 1992 and scanned 2011. This article was written in August 1992 and there have been huge changes in the dive operations in Honiara. I have no idea if any dive operator will go there and if Tambea Resort still exits.